Search for the best flight prices from London Stansted Airport to Lleida. Compare prices, book today and save money with London Stansted Airport. Although many would say that Barcelona is the first city that comes to mind when talking about Catalonia, the heart and soul of the Catalan region is the city of Lleida. The tidy streets feel like a living museum, where every corner features some small piece of Catalonian history – culminating in the colossal Turo Sou Vella Cathedral which towers above the other buildings. With a superb selection of art galleries and festivals, the city also bears the trademarks of Catalonian creativity and the culture it produces. As temperatures peak around 31°C in the summer and rarely drop to freezing in the winter, weather in Lleida is standard for northern Spain. The city boasts many picturesque parks that offer spectacular days in the sun – which is useful as the nearest beach is around 100km away. Lleida is a hidden gem and a fantastic destination with an irresistible combination of history, culture and climate. Surprisingly, Lleida has accommodation to rival that of Barcelona, even though it’s a less common holiday destination. If you’re looking for a luxurious stay in the city you should consider the Finca Prats Hotel, which features a beautiful golf course, an indulgent spa and modern rooms. There is less choice for families within the city, however, it’s still possible to find plenty of hidden gems further afield, including the Hotel Vall Fosca which sits nestled between the surrounding forests and a mountain range. Look for the chain hotels within the city if you’re backpacking or trying to keep costs low as these establishments often have the best nightly rates. With a 2.5km high street that boasts over 450 shops, it’s easy to see why Lleida is considered an incredible shopping destination. You’ll be able to find everything in the main shopping district, including both the best of local Catalonian produce and the biggest global brands. You can also visit the Ramble de Ferron antique market on Sundays if you’re in the mood for a little bargain hunting. Be sure to try the best of Catalonian cuisine while visiting Lleida. As the region is famous for creating many Spanish delicacies that are loved around the world there’s nowhere better to taste them. Tapas is a natural choice as you’ll be spoilt by the mouth-watering selection of dishes. Keep an eye out for the region’s specialty dish pa amb tomaquet, toasted bread and tomato, which often comes with botifarra, a type of sausage that tastes like Cumberland. Those who prefer deserts should try crema Catalana which is similar to French crème brulee but with a strong cinnamon flavour. The most prominent display of Lleida’s relationship with France, Aplec del Caragol is a festival in May dedicated to snail eating where escargot is brought into the city by the boatload. Be on the lookout for the many weird and wonderful flavours that street sellers use to stand out from the crowd as each year the chefs try to top each other’s culinary creations. Celebrated with fantastic fireworks and street performances, Festa Major Lleida is a celebration of the city itself and its history. 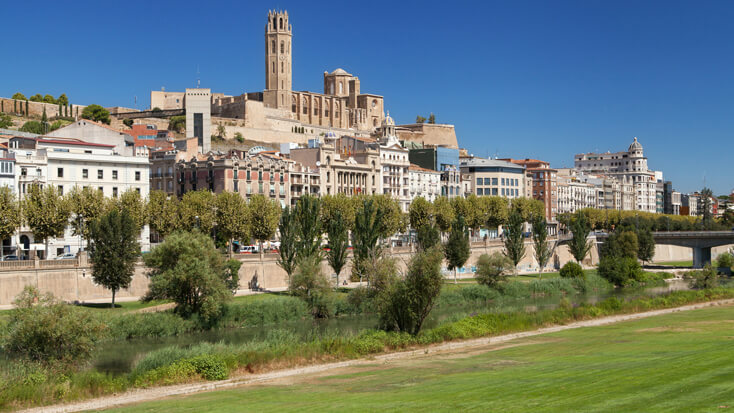 You should put Festa Major Lleida at the top of your list if you’re hoping to truly experience the culture of Lleida and the wider Catalonian region.